For dressing: In glass jar or container with lid, shake together yogurt, canola oil, lemon juice, sugar and salt. 1. 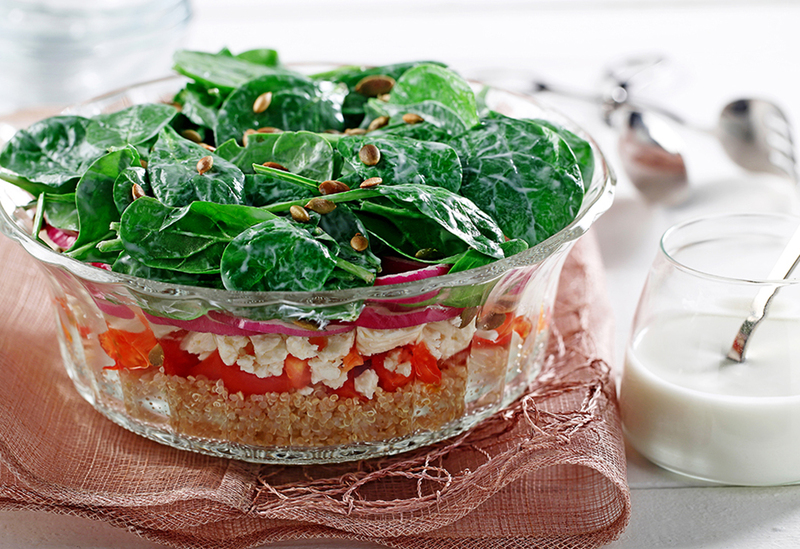 In large bowl, toss spinach with 3 tablespoons of dressing and spoon into bottom of clear serving bowl. Sprinkle onions on top to form second layer of salad. 2. In large bowl, combine quinoa with 3 tablespoons of dressing and spoon atop onion layer. Sprinkle tomatoes, feta and pumpkin seeds on top and drizzle with remaining dressing. Serve immediately.